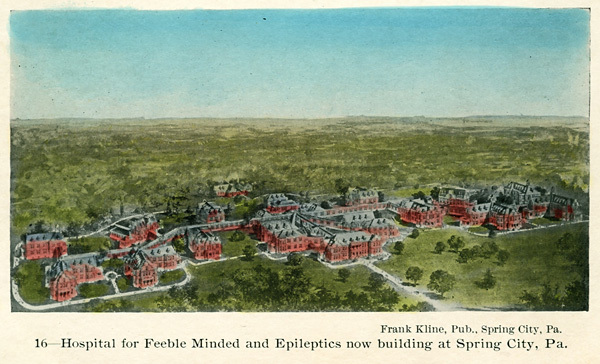 An early postcard shows the proposed "Hospital for Feeble Minded and Epileptics". The fabled site of a new birth of freedom for persons with disabilities, Pennhurst was created in 1908 for the detention of persons with intellectual and developmental disabilities. The first residents literally built the campus, brick by brick. Over the course of the institution's near-century of operation, they and some ten thousand other residents would manage every other aspect of Pennhurst's operation—unpaid and unable to leave. The culmination of centuries of misunderstanding of disability, early neglect and abuse at Pennhurst shocked the conscience. Two Federal District Court rulings in the 1970s declared forced institutional confinement of mentally retarded citizens unconstitutional and recognized their right to education. Landmark rulings by the U.S. Supreme Court set national precedents at Pennhurst, now regarded as the epicenter for the modern disability rights movement. A reminder of the dangers of classifying persons as "the other," Pennhurst's closure in 1987 was a model for de-institutionalization efforts across the world. In 2008, the Pennhurst Memorial and Preservation Alliance was added as a member of the International Sites of Conscience, a worldwide network of "Sites of Conscience" – historic sites specifically dedicated to remembering past struggles for justice and addressing their contemporary legacies. The Pennhurst Campus is eligible for the National Register of Historic Places. Recognizing Pennhurst's significance and the serious threats to its future, Preservation Pennsylvania named it one of the Commonwealth's most endangered treasures for 2008.